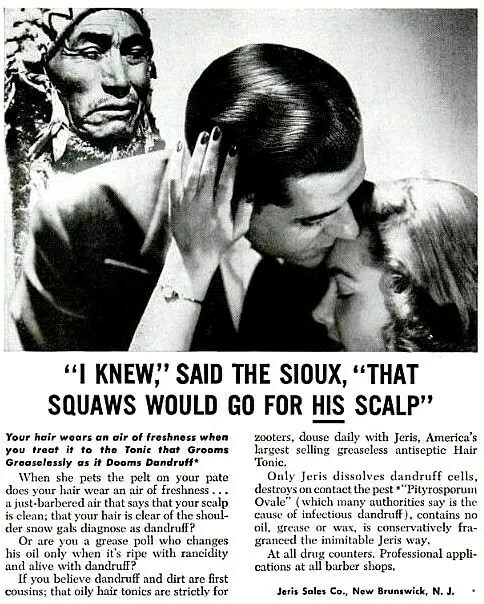 Rule #1 in advertising copywriting: try not to use phrases like “ripe with rancidity and alive with dandruff.” Even if you ARE a cool-cat, jive-talking daddy-o junior adman who’s obviously been given his first gig by the execs to try to reach the younger, dandruff-infested, with-it crowd. This entry was posted in 1950s, Body & Bath, Cosmetics & Toiletries, Politically Incorrect, Z312, Z413 and tagged Vintage Advertising. Bookmark the permalink.